In my last post, we made two steps down a short list of hallmarks of Agile through the lens of Levels of Work. Today, we move down the list to rapid decision making. Technology is transforming analog organizations to digital organizations. Many decisions (made with incomplete, unknown or unknowable data) become calculations (complete and known data) according to defined algorithms. A decision is made in the context of incomplete information. A calculated adjustment is made in the context of complete data. In the digital world, this data is captured in real time and is more transparent to more people in multiple functions. There will be no more waiting for a report from accounting. That data will be available in real time. And, with that accurate data available in real time, there is no need for a role that captures, collates and compiles the data, no need for a role to review the data. Analog roles slow things down. Levels of Work acknowledges that some roles will be gone and new ones appear. The level of work is likely to be higher. It is no longer a matter of gathering and compiling data, it is a matter of which data to stream, to whom. Which data is relevant, which data irrelevant? What sensors gather the data to stream? What new sensors are available to gather new data? What sensors are obsolete? In what technology do we invest our limited resources? Our decision making and learning cycles have to come faster. 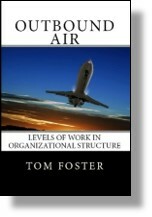 This entry was posted in Accountability, Levels of Work, Organization Structure and tagged decision making, learning cycles, problem solving on January 25, 2019 by Tom Foster.